BICC brief 37 is based on the proceedings of the Seminar ‘Environment and Conflict—Evaluating and strengthening the means of interdisciplinary cooperation’, which took place in Bonn from the 18–20 September 2007. This Seminar was organized by BICC in cooperation with GMOSS (Global Monitoring for Security and Stability). The environment-security nexus is not a new topic in academic and political discourse, but it has currently gained new significance due to a number of factors. Growing concerns about global environmental change including climate change and fears about increasing demand and competition for natural resources caused by population growth and economic development both figure prominently among these factors. 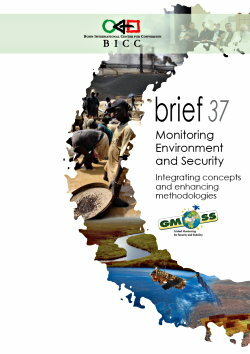 The primary goal of the seminar was thus to locate GMOSS thematically in the field of environment and security research. The focus was on (1) the identification of research gaps in this field and (2) the elaboration of options for interdisciplinary cooperation, especially with regard to how opportunities and benefits of remote sensing can be implemented in the framework of the challenges posed by global environmental and climate change. To this end, the Seminar provided a platform for open discussion and exchange between experts from various professional backgrounds. Particular emphasis was placed on the possibility of reacting to and commenting on presentations as well as moving into real interaction and dialogue.